Lindsey Courson of Tallahassee was 26 and expecting her second child. Her first, a little boy named Camden, was a healthy, rambunctious 1 ½-year-old, and she and Clay, her husband of five years, were ecstatic about their new addition. They weren’t yet aware that they would be embarking on their most difficult journey yet. Their baby, a little boy they named Collin, arrived on March 10, 2011, through a planned C-section. Upon delivery, doctors immediately noticed that something was wrong. Collin had a hole in his back, exposing his spine and threatening his survival. The dangerous condition, called spina bifida, required surgery within the first 24 to 48 hours of his life. Collin was quickly diagnosed with the most severe form of spina bifida, called myelomeningocele, in which his spinal cord failed to close during fetal development early on in his mother’s pregnancy. Due to this, many of his nerves were exposed throughout development, resulting in damage to the cord as the pregnancy continued. Collin was in danger, and the hospital he was born in did not have a neonatal intensive care unit, or NICU. He needed be transferred to another medical center quickly. Under the loving watch of his father, Collin was transferred to another hospital in Tallahassee that had a NICU while Lindsey stayed behind, unable to travel after her C-section. There, Collin’s family was given a choice. He needed to be transferred again to a hospital more equipped to handle his crucial imminent surgery, and his family had to choose between another facility and UF Health. On the evening of his birth, Collin and his father traveled by ambulance from Tallahassee to UF Health Shands Children’s Hospital in Gainesville. The day after Collin was born, doctors at UF Health closed his spine and attempted to place all of the previously exposed spinal nerves back into his body. They discovered that Collin had a second condition, which typically accompanies myelomeningocele, called hydrocephalus, meaning he had fluid backup within his brain. The condition is chronic, meaning Collin will be dealing with it for the rest of his life. 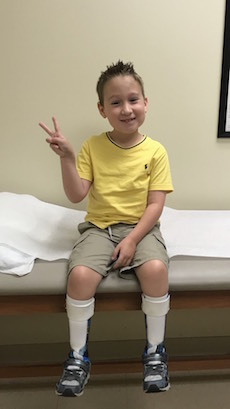 During this time of diagnosis and agonizing discovery, Collin’s family was assisted by a social worker who helped coordinate meetings with the pediatric neurosurgeon and Collin’s other doctors at UF Health. Lindsey credits the hospital, its staff and its nurses as the best elements of her experience due to their care and kindness during one of the most difficult times in her life. To combat the hydrocephalus, pediatric neurosurgeons placed a shunt in Collin’s brain, which would drain the excess spinal fluid. Unfortunately, shunts can have issues over time, sometimes rarely, sometimes commonly. Over the next seven years, Collin’s shunt required 11 revisions, meaning he’s undergone 11 brain surgeries since birth at UF Health. Procedures like these have become a part of Collin’s routine now, but Lindsey thinks back to those early days as a time of fear and emotion, overcome by the reassurance and understanding that UF Health was prepared to save her son. “I remember walking into UF Health Shands and just being in awe of the staff, the facilities and the hospital,” Lindsey said. She experienced a similar emotion in 2017 when she was introduced to a new pediatric neurosurgeon for Collin for the first time since she’d arrived at UF Health in 2011. Initially, there was apprehension. Then, there was relief. When Lindsey met UF Health chief of pediatric neurosurgery Lance S. Governale, MD, she knew that her baby would continue to be treated with the highest level of care and expertise. Governale describes the surgery as long and rigorous, but crucial to the success of Collin’s growth. The surgery was successful, and Dr. Governale was able to detether Collin’s spinal cord, relieving the tension on the spinal nerves and improving his symptoms. Since then, Lindsey has been shown time and time again that Dr. Governale goes out of his way to help his patients get the best care possible, especially those like the Coursons who are traveling from out of town to UF Health. Dr. Governale has even helped with accommodating MRIs to work around the schedules of those coming to UF Health from out of town. “If somebody is coming to us from outside of Gainesville, and they need multiple appointments, we try to make sure they are scheduled the same day,” Governale said. Lindsey is thankful for it all, as it has allowed Collin to live a relatively normal life, despite the conditions he deals with every day. Since birth, now 7-year-old Collin has had leg weakness and numbness, but he pushes through and walks with the help of braces. Despite these challenges, Collin remains an active kid with a big heart. He does well in school. He loves to visit the beach, go boogie boarding and swim in the family pool. He plays with his brother and rides the toy four-wheeler around outside (with a helmet, of course). To the average person, Collin appears to be a regular child with a mild disability. This, Lindsey says, is a blessing she owes to the hard work of the physicians and staff at UF Health. Lindsey remembers the advice she was first given at UF Health from a physician assistant on staff, and she offers it to other moms who might be discovering their babies have serious health conditions, like spina bifida or hydrocephalus.